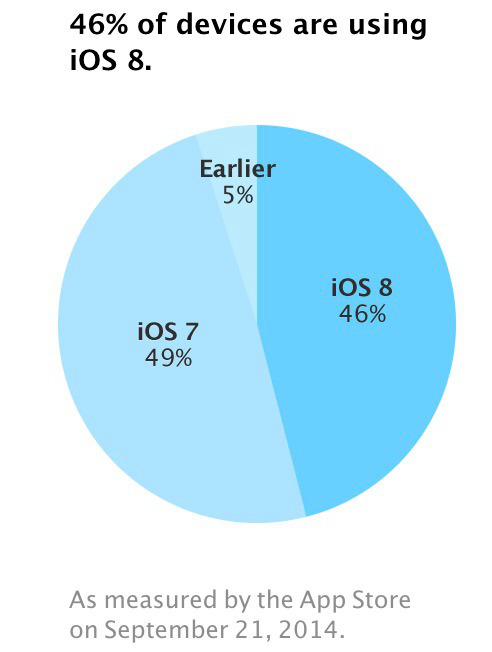 Apple’s new iOS 8 is now on almost half of the iOS devices all over the world. Apple put up a graph on its App Store Distribution page showing that 46% of devices that visited App Store as of September 21, 2014 had iOS 8 installed on them while on the other hand iOS was found on 49 percent devices and only 5% devices were on older iOS versions. Apple never force its users to update to the latest iOS but the staggering number of Apple devices already on the latest iOS 8 shows how popular the new iOS version is among Apple users. iOS 7 last year also saw the same growth rate, particularly due to major overhaul of iOS UI that attracted a lot of people and early adapters to upgrade their mobile devices to iOS 7. 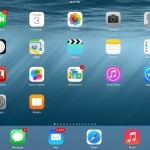 This year, iOS 8 didn’t provide much UI changes but had a lot of new and exciting features that attracted the mass. The stats show that developers who have their apps on the App Store should quickly release an update of their app to use the new iOS 8 features and give user another reason to download their app. Users need to update their apps manually by visiting the App Store. However, any app that is already updated on App Store for the iOS 8 version does not need any further update. iOS 8 adoption rate is high among Apple users but the rate of App Store app submissions has fallen down to 74% among which 53% of the apps are pending review for the new iOS 8. Usually, after the launch of the new iOS, submission rate ranges between 90 to 95% but this year, it has fallen down.